In early 1938 the 2nd Battalion The East Surrey Regiment received orders for overseas service while stationed in Colchester. The Battalion was commanded by Lt Col E L L Acton, MC., the Adjutant being Captain F A H Magee. Lieut W G Gingell MBE MM was the Quartermaster and the Regimental Sergeant Major was RSM E Worsfold. The Battalion was to move to Shanghai which was an exciting prospect! 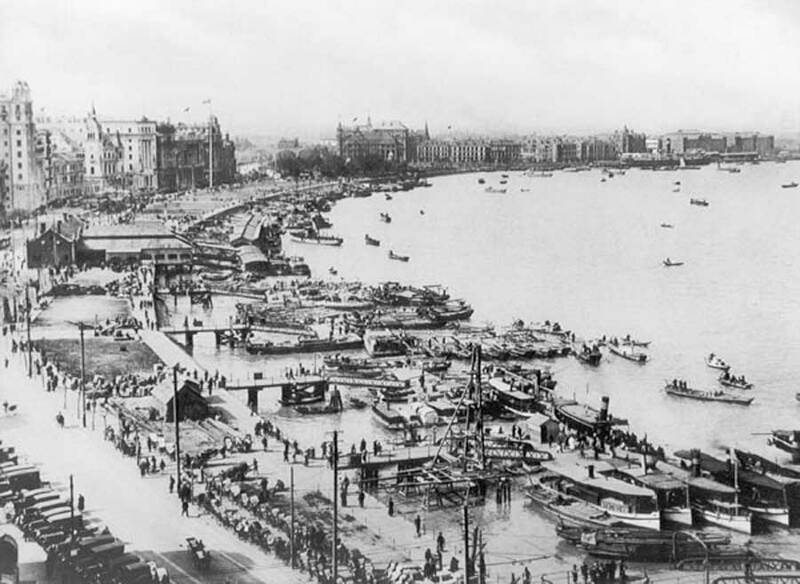 Shanghai was a colossal city inhabited by people of many nations. It contained an International Settlement and a French Concession. The area was already densely populated and in addition over a million refugees had arrived in the city to escape the Japanese Army that had occupied vast tracts of China and had their greedy eyes on Shanghai itself. All this made for an interesting and unusual posting. The Battalion sailed from Southampton in HMT Lancashire on 1st September 1938. A call was made at Port Sudan to pick up 3 officers and 150 men left by the 1st Battalion on their return to the UK. The next calls were at Aden and Colombo where there was an opportunity to go ashore. As the situation in Europe was now extremely tense, the Battalion was diverted to Singapore, disembarking on 29th September, to augment the Garrison. After a fortnight ashore the tension had eased and the Battalion was once more on its way. They left on 12th October on board the Submarine Depot Ship HMS Medway and sailed for Hong Kong. The voyage with the Royal Navy was very pleasant and some wags thought they were Marines once more! On arrival on 17th October they were met by the Royal Scots who had done everything to welcome the Surreys. The camp at Mount Nicholson, although under canvas, was ready for them. After about a month the Battalion once more were on their way and boarded the SS Santhia, a British India cargo ship, for the final stage of their journey. Although the variety of the journey was enjoyed, no one was sorry to settle once again into barracks of their own and forget the cries of 'starboard' and 'port'. Two British Infantry battalions were stationed in Shanghai and the Surreys joined the 1st Bn The Seaforth Highlanders who were accommodated on the Race Course. The Surreys were in the main camp in Great Western Road, a collection of wooden huts, forerunners of the Nissen hut, partitioned into offices and rooms. A detachment of two companies under command of Major F B B Dowling, MC., was two miles away at Jessfield Park. Soon after arrival Lt Col G E Swinton, MC., assumed command of the Battalion and the adjutancy passed to Captain C E Poole. The wire fence which separated the International Settlement from the territory in Japanese occupation was near the camp, so the Surrey sentries had not far to go to join the sentries from the French and American units. They all stood cheek by jowl with the Japanese, each quite unconcerned by the others proximity. This wire boundary was along the Shanghai - Nanking railway and was known as the 'Perimeter'. The Surreys always had a company on guard under the command of a subaltern. The Japanese guarded their side: Relations with them were formal but not friendly. The sports facilities were all in the occupied territory. No one took much notice of the to-ing and fro-ing. On the other hand when the Japanese wanted to be unpleasant they would stop a soldier at their check post and demand to see his cholera pass, a certificate that the man had been inoculated against cholera within the last two months, and keep him hanging around. One soldier remembers being ordered off a train on his way to Tientsin and being kept in the snow for two hours for no apparent reason. The Japanese were continually brutal to the Chinese, ill-treating and killing them. Objection was made when Chinese corpses were left on the road and a request then had to be made to the municipal authorities for their removal. It was soon found out that this pleased the Chinese as they obtained free burial! Hardly had the companies settled in, before they were called out to take over Perimeter duties from the Seaforths. This entailed the manning of five level crossing sentry posts, two traffic control posts and one motor patrol. The first time it was difficult to take in all the complexities. At the first post a sentry had to be posted where there was a French soldier and a Japanese one already in position. Sentries were about 20 yards apart with a patch of neutral ground in the centre. The motor patrol proceeded round the Perimeter every two hours to check everything was in order and that no one had tampered with the barbed wire. Sometimes our sentries swapped lumps of coal for bottles of milk with the Japanese. Other duties had to be performed such as policing the large International Settlement, which duties were shared with the Seaforths, and American, French and Italian troops. A high standard of ceremonial was maintained. Guards had to be provided for the British Ambassador and for the Consul General. On occasions the battalion had to provide an in-lying piquet, consisting of two platoons, to move at very short notice to any emergency in the city. Sgt A E C Holmes, already a veteran of India and the Sudan days with the 1st Battalion, joined a draft on HT Nevasa. On reaching Hong Kong they were transferred to a smaller ship, the Wu Sung. Accommodation was uncomfortable and cramped. They met the tail end of a typhoon in the South China Sea, and with the smell of cooking by the lascar crew and the ship breaking down, it was a terrible journey. A great sigh of relief went up when the ship docked at the Bund, Shanghai. After disembarkation, the draft marched along Bubbling Well Road to Great Western Road Barracks. Sgt Holmes was lucky not to encounter the pirates that roamed the China Seas. In those days several such ships had been captured by pirates who came on board disguised as passengers. All these ships were fitted with massive steel bars preventing any access between cabin and deck passengers. The latter had to bring all their food, drink and bedding on board with them and on embarkation they were searched. At the steel bars were police guards armed with Thompson sub-machine guns, constantly watching the deck passengers. Most of the men on this draft from the UK had been issued with Battle Dress, which had not been seen in China before. The Commanding Officer immediately had Service Dress issued as being more appropriate for ceremonial duties. When war with Germany broke out, the Battalion packed and crated all its peacetime silver and chattels and went on to a war footing, ready to move at short notice, and were effectively camping out in their barracks. It soon became clear that it was not going to get any embarkation orders, and apart from a few lucky officers and men who went back to the UK, the rest stayed put. The Battalion followed closely the events of the phoney war and the Dunkirk campaign. Major parts of the city were now placed out of bounds, life went on largely as before and the Battalion settled down to playing a significant part in that strange rabbit warren of a town. For example the Chinese were football mad, with professional as well as amateur teams. The Battalion crowned its laurels by beating them all to win the International Settlement Cup. In December 1939 one company, made up to a strength of 200 men under Major F B B Dowling, MC., was sent to carry out guard duties at Tientsin, and Captain C O' N Wallis with 50 men was stationed in Peking as Legation Guard. It was here that the men were issued with Russian style fur hats on which the Regimental cap badge was worn. Extra winter clothing also was issued against the extreme cold. It was difficult to find time for much organized sport, but Private Dave Clemens, a long distance runner, was already well-known outside the Battalion, winning many prizes for the Regiment and the Army. Shanghai was full of highlights, a city of contrasts and conflicts, the latter so common that only those involved took any notice. It was a great commercial port where banking, shipping, opium dens, prostitution, first class shops, restaurants, hotels and schools went hand in hand with poverty and disease. Old-timers remembered that it was a city where it felt great to be alive, and had earned its title as "The Paris of the East". A great attraction was how far the money went! A taxi cost fourpence. In many bars drinks were not measured, the waiter went on pouring until told to stop! The Japanese military were allowed into the International Settlement provided they wore civilian clothes, similarly our soldiers were allowed to cross the Perimeter with the same proviso. Our Band was in constant demand for military occasions, dances and concerts. The hundreds of night clubs were reported to be full of gorgeous White Russian princesses, available for dancing for 10 cents a dance. One young Lance Corporal met five Russian princesses in one evening. He wanted to marry one and become a prince, he said, because then he would not have to be Orderly Corporal! What his Company Sergeant Major said is not reported! Life was very hectic, burning the candle at both ends - duties and night life. It is not known how many of the soldiers married in Shanghai, but no less than seven officers are known to have married there - so there must have been some magic in the air! Although Shanghai was not a Families Station, three officers' wives paid for their passage out to join their husbands. Only one officer's wife followed the Battalion to Singapore, and, after many difficulties was evacuated to Australia. 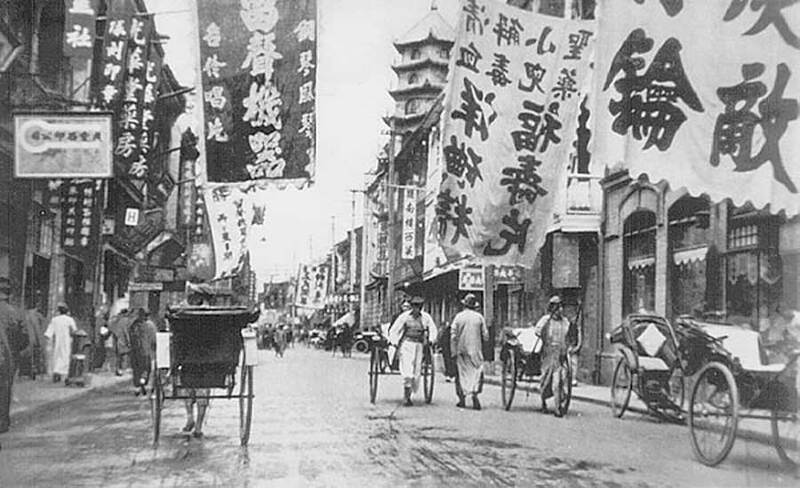 In August 1940 British troops were recalled from China and accordingly the Surreys left Shanghai. It had been a strange position to have been in, in the middle of the Second World War, an inadvisable situation and although everyone would have given their eye teeth to get back to the UK, or wherever the action was, it was not to be, and it was with considerable relief that the Battalion eventually embarked and left Shanghai for a more normal soldiering theatre. The battalion was very appreciative of the honour that the 4th US Marines paid the Regiment when they 'trooped' the Battalion out of Shanghai, the Marines' Band leading as the Battalion made its farewell march through the International Settlement into the Japanese Concession to the Docks for embarkation for Singapore. The Tientsin and Peking detachments rejoined the Battalion at Singapore on 3rd September 1940. Thus ended the service of The East Surrey Regiment in China.